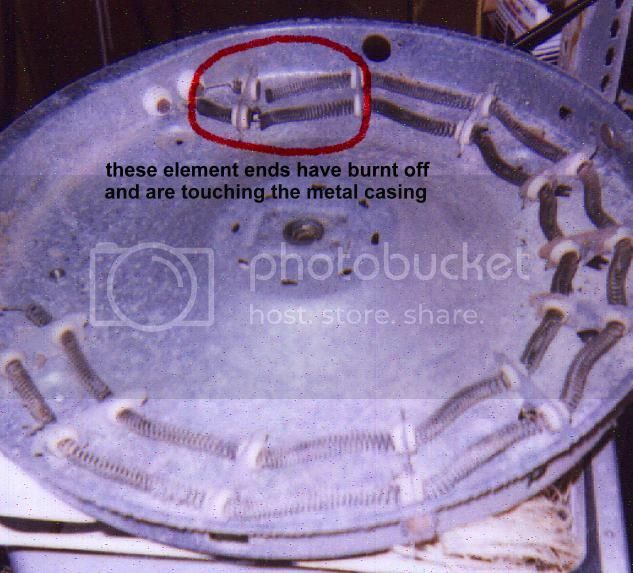 This can be a head scratcher because the heating element in a dryer should only come on when the drum is tumbling. There’s still power to the display and you can run diagnostics but the motor won’t turn on. In fact, this is one of those cases where simply running the diagnostics without any insight into how dryers work can only lead to more confusion. F28 – Moisture Sensor – performed test on Moisture sensor and got the all clear. Not an issue. F30 – Air Flow – checked lint filter and vent hose. Lint filter filthy, wife obviously hadn’t cleaned it in several cycles. What’s a grasshoppah supposed to do with this? What’s anyone supposed to do with this? This doesn’t help narrow down the problem. The element shown above is not the same one that goes in this dryer, but they’re all basically the same, just different shapes. The fact that the motor isn’t running but the control panel still gets power is a sure sign that the thermal fuse is open.